For the former local government area, see City of Toowoomba. 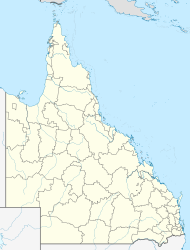 Toowoomba City is the central suburb of Toowoomba, Queensland, Australia, containing its central business district. Toowoomba North Boys State School and Toowoomba North Girls and Infants State School both opened in 1869. In 1937 the two schools were combined to form Toowoomba North State School. The Holy Name Primary School was opened on 23 January 1905 by the Sisters of Mercy who were already operating the school at St Patrick's Church (the church is now St Patrick's Cathedral and the St Patrick's school is now known as St Saviours School & College). The Holy Name school was burned down on 4 August 1919, so the school operated from the Mr and Mrs Hannant on the corner of West and Norwood Streets, until the school was rebuilt. Archibishop James Duhig laid the foundation school for the new church and school on 23 November 1919 and officially opened it on 23 January 1921. The Toowoomba City library opened in 2016. The Toowoomba local history library opened in 1999 with a major refurbishment in 2016. Toowoomba City contains two significant shopping centres, presently under the same ownership. Grand Central Shopping Centre, with a GLA of 46,000 square metres (500,000 sq ft), contains the region's only Myer store, as well as a Coles, Target and 145 specialty stores. Garden Town Shopping Centre, across Gowrie Creek and containing a GLA of 12,434 square metres (133,840 sq ft) (2009), contains a Supa IGA supermarket, Best & Less and Lincraft along with 40 other stores. Both are currently owned by QIC, following its acquisition of Garden Town in January 2009 from Aspen Group, they are now being redeveloped to join together via a two level galleria to form one shopping centre. Two smaller centres, the Hooper Centre and a homeware centre, and street shopping along Ruthven Street round out the city centre's retail offerings. There is also a small shopping area on the corner of Ramsay and South streets called Southtown. It contains several eating places, supermakert, newsagent and Post Office. Toowoomba City is situated at the intersection of the New England Highway and Warrego Highway, and contains Toowoomba railway station (the terminus of the Westlander service) and the city's bus interchange on Neil Street, from which various buses depart for the suburbs.Toowoomba also has a taxi facility available. Toowoomba North State School is a government primary (P-6) school for boys and girls located on the south-west corner of Mort and Taylor Streets. In 2015, the school had an enrolment of 157 students with 12 teachers (11 full-time equivalent). Holy Name Primary School is a Catholic primary (P-6) school for boys and girls operated in the Mercy tradition at 188 Bridge Street. In 2016, the school had an enrolment of 154 students with 12 teachers (10.3 full-time equivalent) and 8 non-teaching staff (5 full-time equivalent). The Tooowoomba City library is located at 155 Herries Street. The library is open seven days a week. The local history library is located at 155 Herries Street. The local history library has a comprehensive archival collection that is of local, state and national significance, including the Robinson Collection named after Toowoomba's first female mayor Nellie E. Robinson. This comprehensive collection contains records from local personalities, businesses and community organizations. Both libraries are operated by the Toowoomba Regional Council. ^ Australian Bureau of Statistics (25 October 2007). "Toowoomba City (Toowoomba City) (State Suburb)". 2006 Census QuickStats. Retrieved 4 June 2011. ^ "History". Holy Name Primary School. Archived from the original on 11 February 2018. Retrieved 11 February 2018. ^ a b "Public Libraries Statistical Bulletin 2016-17" (PDF). Public Libraries Connect. State Library of Queensland. November 2017. p. 16. Retrieved 29 January 2018. ^ Leasing Information Services. "Garden Town Shopping Centre, Toowoomba, Queensland". Retrieved 4 June 2011. ^ Transport and Main Roads (Queensland) (March 2011). "Toowoomba/Highfields/Crows Nest bus network" (PDF). Retrieved 4 June 2011. ^ "2015 School Annual Report" (PDF). Toowoomba North State School. Retrieved 10 January 2017. ^ "2016 Annual Report" (PDF). Holy Name Primary School, Toowoomba. Archived (PDF) from the original on 11 February 2018. Retrieved 11 February 2018. ^ "Toowoomba City Library". Public Libraries Connect. State Library of Queensland. 3 February 2017. Retrieved 29 January 2018. ^ "Local history library". Public Libraries Connect. State Library of Queensland. 2 February 2017. Retrieved 29 January 2018. ^ "Tawa (entry 601301)". Queensland Heritage Register. Queensland Heritage Council. Retrieved 15 July 2013. ^ "St Lukes Anglican Church (entry 601878)". Queensland Heritage Register. Queensland Heritage Council. Retrieved 15 July 2013. ^ "Soldiers Memorial Hall (entry 601297)". Queensland Heritage Register. Queensland Heritage Council. Retrieved 15 July 2013. ^ "Toowoomba Post Office (former) (entry 600847)". Queensland Heritage Register. Queensland Heritage Council. Retrieved 15 July 2013. ^ "Strand Theatre (entry 600849)". Queensland Heritage Register. Queensland Heritage Council. Retrieved 15 July 2013. ^ "Exchange Building (entry 601319)". Queensland Heritage Register. Queensland Heritage Council. Retrieved 15 July 2013. ^ "Carlton House (entry 601308)". Queensland Heritage Register. Queensland Heritage Council. Retrieved 15 July 2013. ^ "Toowoomba North State School (entry 650024)". Queensland Heritage Register. Queensland Heritage Council. Retrieved 11 February 2018. ^ "St James Church (entry 601298)". Queensland Heritage Register. Queensland Heritage Council. Retrieved 15 July 2013. ^ "Toowoomba Court House (entry 600848)". Queensland Heritage Register. Queensland Heritage Council. Retrieved 15 July 2013. ^ "Toowoomba Police Station Complex (entry 601710)". Queensland Heritage Register. Queensland Heritage Council. Retrieved 15 July 2013. ^ "Wesley Uniting Church (entry 601695)". Queensland Heritage Register. Queensland Heritage Council. Retrieved 15 July 2013. ^ "Empire Theatre (former) (entry 600978)". Queensland Heritage Register. Queensland Heritage Council. Retrieved 15 July 2013. ^ "Men's Toilet, Russell Street, Toowoomba (entry 601381)". Queensland Heritage Register. Queensland Heritage Council. Retrieved 15 July 2013. ^ "Toowoomba Railway Station, Honour Board and Railway Yard Structures (entry 600872)". Queensland Heritage Register. Queensland Heritage Council. Retrieved 15 July 2013. ^ "Toowoomba Permanent Building Society (former) (entry 600859)". Queensland Heritage Register. Queensland Heritage Council. Retrieved 15 July 2013. ^ "Toowoomba Trades Hall (entry 602768)". Queensland Heritage Register. Queensland Heritage Council. Retrieved 15 July 2013. ^ "St James Parish Hall (entry 600856)". Queensland Heritage Register. Queensland Heritage Council. Retrieved 15 July 2013. ^ "Clifford House (entry 600857)". Queensland Heritage Register. Queensland Heritage Council. Retrieved 15 July 2013. ^ "Kensington (entry 601322)". Queensland Heritage Register. Queensland Heritage Council. Retrieved 15 July 2013. ^ "Wislet (Former Wesley Hospital) (entry 601324)". Queensland Heritage Register. Queensland Heritage Council. Retrieved 15 July 2013. ^ "Vacy Hall (entry 600858)". Queensland Heritage Register. Queensland Heritage Council. Retrieved 15 July 2013. ^ "Toowoomba Foundry Pty Ltd (entry 601300)". Queensland Heritage Register. Queensland Heritage Council. Retrieved 15 July 2013. ^ "Defiance Flour Mill (entry 601306)". Queensland Heritage Register. Queensland Heritage Council. Retrieved 15 July 2013. ^ "Pigott's Building (entry 600861)". Queensland Heritage Register. Queensland Heritage Council. Retrieved 15 July 2013. ^ "Karingal Chambers (entry 600862)". Queensland Heritage Register. Queensland Heritage Council. Retrieved 15 July 2013. ^ "Alexandra Building (entry 601317)". Queensland Heritage Register. Queensland Heritage Council. Retrieved 15 July 2013. ^ "White Horse Hotel (entry 600863)". Queensland Heritage Register. Queensland Heritage Council. Retrieved 15 July 2013. ^ "Toowoomba City Hall (entry 600865)". Queensland Heritage Register. Queensland Heritage Council. Retrieved 15 July 2013. This page was last edited on 26 December 2018, at 10:31 (UTC).